Hannah Genders visits a farm that benefits the community. I have to tell you how I found out about Rush Farm and the exciting project that it is. I have a friend in London who had sent me a text to look up a co-operative eco farm somewhere in Worcestershire – she’d heard of it via a friend in Leicester who knows the son of the family living there. When I looked it up I realised I have actually cycled past it many times and noticed the organic certificate on the entrance but had no idea what was going on there. So, notebook in hand, I pedalled up last week (it’s near Inkberrow and about four miles from where I live) to interview Sebastian Parsons and find out more about the project. Sebastian, as I mentioned before, is the son of the family who live at the farm, and is also founder of a scheme called The Stockwood Community Benefit Society, which was set up to offer the farm and business park into community ownership. The scheme seeks to combine a sustainably-run business park incorporating about 29 units, and an organic, bio-dynamically-run farm producing local food to the highest standards alongside habitat creation for wildlife. 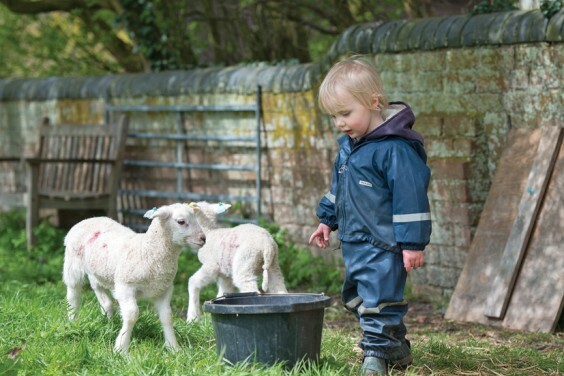 Rush Farm has in total 150 acres of land, with around 22 acres of mixed woodland – some is set down to a rotational coppice and some is set aside for education and Forest School-type activities. The whole farm is certified organic and is run on biodynamic and permaculture principles. In its simplest terms this means the farm and all that is done there is run organically for the benefit of the animals, people, and the environment and seen as a community resource. It is a highly-sustainable form of agriculture that encourages wildlife and habitat creation, and all this is evident when you visit the farm. The herd of Hereford cattle looks positively brimming with health, as does the flock of Llyen sheep – both are heritage breeds; the cattle from Hereford, the sheep getting their name from the Llyen peninsula in North Wales. They are known for their hardiness and are important in animal conservation. The organic meat from these is sold at local butchers’ and farm shops. As part of the wildlife conservation, the farm has cleared and re-instated a wetland area and pond. The Bow Brook also runs through the farm; it was only a bubbling stream on the day I visited but evidently can envelop several fields when in flood. There have been regular sightings of kingfishers along the banks. Other farmland birds that have seen their numbers drop so much in the last decades are being actively encouraged into the farm. These include lapwings (there have been at least three pairs of nesting lapwings this year), curlews, skylarks, corn buntings and barn owls to name but a few. There are already tawny owls and little owls in the woodland. The kitchen garden is run on the same principles and is an area the farm would like to see expand. They currently have one polytunnel and several beds providing organic vegetables to the café and people working in the business units on site, as well as a veg box scheme. So, in summary, a very idyllic place, something many people would like to be part of – and this is the best bit: you can! As the principles of community are so important to the vision of Rush Farm and the scheme, the first share offer to buy into the farm was started in September 2015 and managed to raise enough capital to buy the farm. The second share offer has also been very successful and has raised enough to install renewable energy for the entire farm and business units in the form of a ground source heat pump and photovoltaics. This was being installed as we walked round, meaning the whole site will be heated and run on green energy. The third share offer is due to start in October this year and more details can be found on the website listed at the end of this article. You can invest as little as £100 and the return is set at five per cent, which is generated from the business unit rents. If all this isn’t enough to tempt you to be part of this visionary project, Rush Farm was also the place where The Archers started. Godfrey Baseley, who was a friend of the family living in Rush Farm in the 1950s, was inspired by the family stories of bustling rural life, and started writing the Archers storyline. The very first episodes were recorded from the farm itself. The farm and community website is: http://www.stockwoodcbs.org, and they are setting up a new website that should go live in October. The next open day will be their Christmas Fayre on December 3 at 4pm.